I’ve seen her around the place too. Hard not to notice her. I probably would never have remembered her if you hadn’t done this. I guess now she has at least one more person to remember her. What a touching story. My hope is that some one out there sees this picture and identify her. Happy to pass this on. As you said “Rest in peace good servant”. A lovely tribute Mike, a very kind sentiment. So many in our society fail to realize that a life, any life is worth far more than the financial or even social value of the image you see today. No doubt little will be done regarding the injustice of her death.And who can say if she will represent more than a passing inconvenience to the driver of the vehicle: the remembrance to be washed away in the next shower. At least in our father house one is judged by the totality of ones existence and not merely by the cut of the cloth. Vince - Prince George, BC. I once remembered seeing Aunty Yvette sitting outside at the back St. George’s Cathedral. I looked at her and saying to myself, look how we discard people whom I am sure contributed to the building of Guyana which many of us enjoy today. 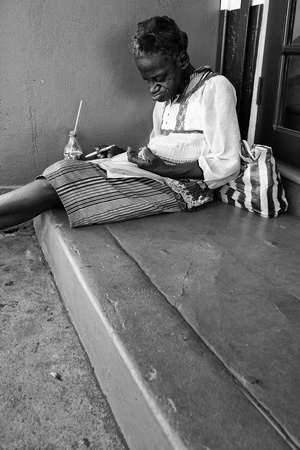 I also often wonder of the other elderly homeless citizens in GT and other parts of Guyana, whom I am sure were active so many years ago and life has treated them badly, requiring them to live on the streets. Thank you Aunty Yvette for the many lives you have touched.